Cleanings – We have a staff of licensed dental hygienists who are here to provide you with a thorough dental cleaning. They are trained to provide hygiene services for adults, children and patients with various medical conditions. We offer a full periodontal program for our patients with gum disease, as well (see periodontics and scale and root planing below). 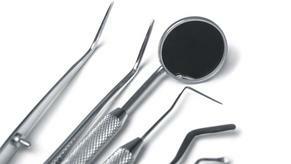 Periodontics – These procedures are related to the gums. Periodontal diseases are infections of the gums. Remember the gums help to hold the teeth into place. Severe infections that are left untreated cause bone loss. The infections are caused by plaque, which contains bacteria. The bacteria irritate the gums and cause them to look red and swollen and to bleed when you brush your teeth and floss. Gingivitis is the early state of gum disease. Regular cleanings and good oral hygiene will help reduce the severity of the disease. Severe cases of periodontal disease are treated with scale and root planing. Scaling & Root Planing – Often referred to as a “deep cleaning”, this procedure removes the plaque and tartar that is below the gum tissue. Scaling and root planing may take more than one visit, if a patient needs his entire mouth treated. Sometimes the procedure is only needed for specific areas that are more severely affected (isolated scale and root planing). The purpose of this type of cleaning is to remove the bacteria that are below the gum tissue, and irrigate the area with an iodine mixture. Once the plaque has been removed and the roots of the teeth are smooth again, the gums should re-attach to the tooth and help to prevent bone loss. X-rays – X-rays are taken in accordance with the standards that are established by the American Dental Association. Typically, bitewings (which are taken to show decay) are taken once a year, while panoramic x-rays (which are taken to provide information about the nasal areas, maxillary sinuses, tooth positioning and gum and bone irregularities) are typically taken once every five years. Panoramic x-rays can reveal advanced periodontal disease (see below), oral cycsts, tumors and oral cancer, impacted teeth, TMJ and sinusitis. Fluoride – This mineral occurs naturally in all water sources. We use it to help prevent cavities in both children and adults. It also helps to repair weakened enamel before a cavity forms. Sealants – A sealant is a plastic resin material that is applied to the teeth where decay most often occurs to help provide another layer of protection against decay. This is typically on the chewing surfaces of the back teeth. These teeth often have pits and grooves that are difficult to keep clean since our toothbrush can’t reach into the small pits and grooves. Sealants can be placed for kids, as well as adults. Custom Athletic Mouth Guards – The purpose of the custom-made mouth guard is to help improve compliance with the athlete actually wearing the mouth guard. The primary reason that athletes choose not to wear their mouth guard is because it is uncomfortable. We will take a custom impression of your mouth and form a mouth guard that is made to fit you. These take one appointment for the impression and require about a week for Dr. Stine to fabricate. Fillings (tooth-colored, composite fillings) – Fillings are placed immediately after Dr. Stine removes the decay from the tooth. The resin compound material is placed in the spot created where the decay has been removed. Dr. Stine will complete the filling and adjust the bite in one appointment. Crowns – Sometimes the cavity in a tooth is too large for just a filling. In that case, Dr. Stine will remove the decay, and create a “cap” to cover the tooth. The purpose of this treatment is to make the tooth stronger. It also improves the appearance of the tooth. Sometimes crowns are placed when a tooth is worn down, cracked or otherwise weakened. Crowns are recommended after root canal treatment, as that procedure removes the blood supply for the tooth and therefore can cause the tooth to become brittle. Crowns require two appointments. One to remove the decay, prepare the tooth for the placement of the “cap” or crown, and make an impression of the area to be restored. A temporary covering will be placed over the tooth until the final crown is created by the dental lab (a process which takes approximately two weeks). The second appointment will involve the removal of the temporary covering and the cementing of the permanent, custom-made crown, along with adjusting the bite, as needed. Implant Crowns – Permanent replacement teeth that look like and feel very similar to your own natural teeth. We have several, fantastic oral surgeons who work with us to place the dental implant (a metal post that is surgically placed into the bone of the jaw beneath the gum tissue), while Dr. Stine creates the crown restoration that will sit on top of the implant. ​Aesthetic Crowns – See the definition of crowns above. The function of this particular type of crown is primarily to improve the appearance of the tooth. Veneers – A porcelain veneer is a thin shell that is custom-made to fit onto your existing tooth. They are strong and long lasting, have the appearance of a natural, healthy tooth, don’t stain easily, and require removal of less of the natural tooth structure than a crown. The purpose of porcelain veneers is to cover teeth that are stained beyond bleaching, chipped or worn, crooked or uneven. They are primarily used to improve the appearance of the teeth. Extractions – The purpose of an extraction is to remove the tooth and root due to decay, disease or trauma. Extractions can be basic or complicated (surgical) depending on the circumstances of the tooth and the root. Root Canal Therapy – The purpose of this procedure is to remove the infected tissue from your tooth in order to save the tooth and prevent injury to the jawbones and detriment to your overall health. Once a tooth has emerged through the gums, the primary function of the tooth’s nerve is to provide the sensation of hot or cold. When a tooth is cracked or has deep decay, the bacteria that caused the decay can enter into the actual center or pulp tissues of the tooth and cause an infection, typically resulting in pain and swelling. Root canals usually take two appointments. The first appointment involves Dr. Stine removing the infected tissue and the decayed part of the tooth. He then cleans the inside of the tooth, places a medicated material as needed, and temporarily seals the tooth. During the second visit, the temporary material is removed and a permanent filing or crown is placed on the tooth. Custom Bleach Trays – Teeth can become stained and discolored over time due to contact with foods, drinks, cigarettes and regular wear and tear. We offer our patients professional whitening trays that are custom made for comfort and effectiveness. The trays take about a week for Dr. Stine to fabricate and begin with a visit to the office for an exam to ensure that you are a good candidate for bleaching. At that visit impressions of your mouth will be taken to use to make your custom trays. The trays are a thin, flexible, clear plastic material that is designed to fit snuggly over your teeth. The cost of the trays includes tubes of whitening solution that is used to put in the trays to remove the stains. Since the trays are custom fit, they will limit the amount of bleaching solution that comes into contact with your gums helping to limit sensitivity. Same-Day Denture Repairs – We use a local denture lab. Most of the time, repairs can be turned in 24 hours. Drop your denture to us in the morning and get it back, repaired, before the end of the business day! Nitrous Oxide – This product, also known as “laughing gas” can help anxious patients experience a more pleasant dental visit. Nitrous oxide makes it possible for dental procedures to be performed in less time and with less stress for the patient. It also typically allows dental patients to drive themselves to their visits and return to normal activity immediately after being treated. 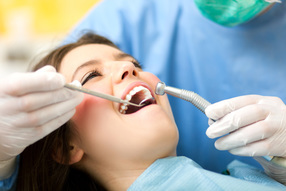 Workers Compensation - Do you need dental treatment as a result of a work-related accident? If so, you're in luck! Dr. Stine is an authorized dental provider for the Ohio Bureau of Workers Compensation (BWC). If you have been involved in a work-related accident that has damaged your teeth, please contact us. We are here to help compile the information needed to properly document your claim, request approval for treatment and treat the injury in compliance with the rules outlined by the BWC. Our goal is to put the patient back to an oral condition as close as possible to that which existed prior to his work-related injury.